Theatre Beyond Words (www.theatrebeyondwords.ca) was founded in 1977; you’ve probably already fallen in love with their Potato People, a series of 14 non-verbal mask plays that remain seminal in the development of mask and visual theatre in Canada. Artistic Director Robin Patterson–a graduate of Simon Fraser University and École Jacques Lecoq in Paris, France–specializes in mask, clown, and commedia techniques, which have taken her from International tours to Brock U, ON and Niagara U, Niagara Falls, NY where she currently teaches theatre. 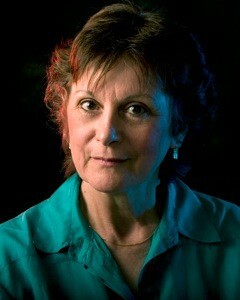 Terry Judd, Co-Artistic Director and founder, also teaches physical theatre courses in the Niagara region. Other theatre credits for Terry include the Stratford Festival where he won the Chalmers Apprentice Award; the Manitoba Theatre Centre; Neptune. As actors, writers, directors, teachers, adapters and movers, and with an impressive Canadian theatre track record, we were eager to hear their take on creating work beyond words. As a devised group, how do you approach the initial creation of script? Most of us are actor/creators, so when we are developing our own work we like to start with a group of really interesting characters–often based on a set of masks. We mock up costumes that help define them and choose personal props for them. Then we try them in various combinations and situations to see where they really blossom; create as many scenes as we can; string them together in a logical way; and discover what story is emerging. Once we have the characters and the basic structure, we go back to the beginning and ask: What is missing? What is extraneous? How do we rearrange the scenes so that the story is understandable? Are we on the right track in terms of style and rhythm? Then we look at transitions, which often take longer to develop than scenes. When we manage to put all that on its feet, we record it digitally and that visual record is considered the first draft script. We rarely write it all down, as the actions and style are as important as the text and they are much easier to understand when they are seen in action rather than when they are read on paper. You’ve worked with many well-known writers from John Lazarus, David Craig, to Jason Sherman and James Reaney. What was the starting point in working with a text-based playwright? Was there an ‘ideal’ model that worked best? Everything depends upon the individual artists so there is no ideal model. There are a few starting points, though. Although we are a physical theatre company, we are Theatre Beyond Words, not Theatre Without Words. We devise our own non-verbal work, but we have partnered with playwrights who specialize in text saturated with image. To begin working together we must first know and respect each other’s work. Usually we discover something of mutual interest such as a book that we would like to adapt, an idea we would like to explore or styles we would like to mix. What challenges arise when pairing physical theatre practitioners with text-based playwrights, and how do you mediate those snags? If the script is already written, then before we start we are as clear as possible about how we would like to interpret it. For example, we were once presented with two one-act scripts that were written as regular texted theatre–something we do not normally do. We agreed to produce these plays if we were allowed to “translate” them into physical theatre using a clown style for one and a modern commedia dell’arte style for the other, styles that might require a change in some of the action or text. Intrigued, the playwrights were invited to be present for all workshops and rehearsals. We listened to their concerns and suggestions; they allowed us freedom to play with their scripts. When a difference of opinion about text or action arose, we did not sit down and discuss it: we tried variations on our feet until we were all satisfied with the result. If a script is being developed in workshop, we talk about translating thought or text into action and developing a visual lexicon that the audience learns to read as the play progresses. We give ourselves complimentary tasks: the playwright concentrates on the arc of the story and the text while we focus on developing character detail, strong images, and precise actions to tell that story. Again, we keep proposing variations until we hit upon a solution that is so obviously right and exciting that it pleases all of us. In devised work, the collective is crucial and dominant in the rehearsal process. When you bring in a playwright or director, does any one person take charge of the room? Our working process is best described as a led collective: a designated person takes control of moving the workshop forward with specific objectives. It is usually the director, but could be the playwright. Or it might change from day to day depending upon the focus of the work. The difference, however, is that physical theatre performers are actor/creators with a number of skills besides acting. They might be accomplished writers, designers, choreographers or musicians. So in a collective creation everyone is responsible for suggesting ideas based upon their particular expertise, and it is usually very clear if an idea works or doesn’t work when it is put into action. The director, with strong input from the playwright, makes the final decision on what is included in the final draft. At what point do you bring a director, or other outside eye, into the process? We prefer all the major players to be involved with the process from the beginning and other outside eyes are invited to showings at the end of each workshop period to give feedback on all aspects of the work. Workshops are crucial to the development of a new script. A physical theatre company, especially, must get up on its feet and explore the action in detail to see if it works in reality. For instance, when you are faced with the reality of gravity, how do you make the audience believe that you are flying–flying and not swimming, waving or any number of other possibilities? When the story calls for a crowd and your budget allows for only 3 actors, what are your choices? The actor/creators devise possibilities. But a major part of the process is to present these solutions to an audience to see if they make sense and induce a strong response. For us, two three-week workshops or one five-to-six week workshop is enough before we go into rehearsal and production. We need the real masks, props, costumes and set; we need an audience and an extended run to complete the process of script development. If the play is receiving good response but still has structural or other problems, we take it back into workshop and rehearsal before it goes on the road again. From a practical standpoint, is there an ideal number of characters? For our series the POTATO PEOPLE we prefer to use five actors, a number that allows two characters to remain consistent throughout while the other three actors play multiple characters. Five actors and a stage manager is also a reasonable number of people to tour. Detailed stage directions can be extremely useful. It is best to try the suggested actions a few times to discover their physical logic. They might be perplexing when you read them, but hilarious or surprising when you actually do them. A lovely example of this comes from My Foot, My Tutor by Peter Handke. He directs a character to reach into his left pocket with his right hand and extract an apple. It is a wonderful bit of business and could take quite a while to manage, depending upon the imagination and skill of the actor. But Handke helps by giving previous directions that lead up to this moment so that a seeming nonsensical action is in fact the most reasonable choice. Since you’re creating your performance from scratch, what sort of timelines do you give yourselves? About a year: originally we spent 12 weeks over the summer to create 90 minutes of material. This included creating and rehearsing the play, as well as doing all the production and administrative work. The actual script came last, after we toured the shows for five-to-eight months a year, constantly revising the work depending upon audience reaction and performance experience. We recorded the last performance of the run to use as a video-script. Rather than written notes, we used that visual record to stimulate muscle memory when a show was being remounted or to teach a part to a new actor. Now more than ever timelines are inextricably linked to budget and each stage of a project is undertaken only when the funds are in the bank. Most recently we gave ourselves three weeks to begin the adaptation of a graphic novel; to play; to come up with an approach, a style and the amount of text we thought necessary. It was a luxury we felt would save us time in the long run. Presently we are developing an extended project model. We put the team in place, workshop an idea and present it to an invited audience (three weeks). Next is the design and build stage since we need the real masks, puppets, props, lights and set to continue the work (three-to-six months). Then the play creation stage (three weeks); the rehearsal and production stage (three-to-five weeks depending upon how complicated the techniques are); and finally the performance stage (at least three weeks). We are excited about the amount of really good, innovative physical theatre happening in Canada. The work depends largely upon the specific skills of the actor/creators, writer/directors and other multitalented artists involved. So it is not the state of new plays in general, but the state of companies that produce new physical theatre work that is intriguing to us. We are always interested in seeing new work by well-established companies like Theatre Smith-Gilmour; any production by early to mid-career companies that are pushing boundaries and further developing their own styles like MTSpace, Tottering Biped or Why Not Theatre; and work by emerging artists who are still experimenting, like Hungry Basement. All of these artists have great integrity and commitment to the art form or to collective creation and this bodes well for physical theatre in Canada. Terry: James Reaney’s Donnelly Trilogy because it is a quintessentially Canadian story with a classic Shakespearean-style feud written by a poet who knew the story from personal family-told tales. Robin: Bill Irwin’s production Regard of Flight because it is a brilliant example of a turning point in the modern approach to clowning in particular and physical theatre in general. What advice would you give text-based playwrights on how to work with a collective in a devised, physical theatre setting? Make sure you see examples of the work of the company with whom you are planning to create this new play. You do not have total responsibility for making it work, so be prepared to listen to suggestions from everyone, not only the director, but also the actors, the stage manager, the designer and the cleaning staff. You do not have to take the suggestions, but they might lead you to a better idea in the long run. Be ready to adapt your ideas to their style, interests, skills, and budget. Don’t expect to be in control. Don’t expect to be out of control. You are a partner in the process, so listen well to everyone involved and don’t be afraid to speak up when you have something useful to say.